And was called Vyasa, the Compiler. So, Vyasa had these five compose their individual versions. Only the one recited in his presence by Vaishampayana at Janamejaya’s snake sacrifice is extant in full as transmitted by Ugrashrava Sauti to Shaunaka and his sages in the Naimisa forest during intervals of their sacrificial rite. Of Jaimini’s version, only hisAshvamedha Parva exists in full where it is he who recites it to Janamejaya. The legend is that Vyasa rejected all the other compositions. According to Shridhara’s Marathi Pandavapratapa (17th century), Vyasa condemned Jaimini for introducing his own material. This parva is of great significance because when Akbar commissioned Razmnama (Book of War, 1584, the Persian translation of the Mahabharata), for the Book of the Horse Sacrifice he chose Jaimini’s version over his guru Vyasa’s as is evident from the illustrations. We do not know if he made similar choices for the other parvas because his copy has not been studied, being locked away, inaccessible, in the Jaipur Palace museum. The way in which the name of Janamejaya’s father is spelt (Pareekshit instead of Parikshit) provides a clue to Jaimini’s period, as this spelling occurs first in the Bhagavata Purana. It means, “to look around,” while the Vyasa version means, “remnant (of a ruined family).” Unfortunately, those other parvas are yet to be found. The manner in which Jaimini’s Sahasramukharavanacaritam begins, with Janamejaya’s queries following the return of Sita and her sons to Rama, indicates that it is a sequel to Jaimini’s Ashvamedha Parva account of Lava and Kusha’s battle with Rama. During research for editing the first English translation of the Jaiminiya Ashvamedha Parva,  exciting information was received from Professor Satya Chaitanya, visiting faculty at the XLRI Jamshedpur, that Government Oriental Manuscripts Library and Research Centre of the Tamil Nadu State Department of Archaeology had palm-leaf manuscripts in Grantha script ascribed to the lost Jaimini Bharata. Of 15 manuscripts 2 that were complete, viz. Sahasramukharavanacaritram (The Thousand-Faced-Ravana’s Deeds), and Mairavanacaritam (The Dark Ravana’s Deeds) were critically edited and published with a sloka-by-sloka English translation in free verse by S.K. Sen and myself. Neither has been published previously. The Lava-Kusa manuscript was not included, though complete, as the episode was included in S.K. Sen’s translation of Jaimini’s Ashvamedha Parva. 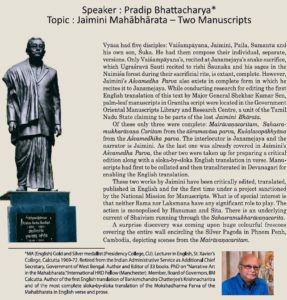 Jaimini is the celebrated author of the Purva Mimamsa and also of the Jaimini Bharata, fragments of which are turning up. Mairavanacaritam appears to be an independent work included in the Jaimini Bharata not claiming connection with any of the parvas. On the other hand, Sahasramukharavanacaritram or Sitavijaya claims to be a part of the Ashramavasa Parva of the Jaiminiya Mahabharata. The link with Vyasa is visible as both these manuscripts have Sita and Hanuman using mantra-infused grass to consume the demons. In Vyasa’s Udyoga Parva (94. 27-30) Nara demolishes the army of Dambhodbhava by launching ishikabhir, blades of grass. Again, in the Shanti Parva (330. 48) Narayna takes an ishika, transforms it into an axe with a mantra and flings it at Rudra. Jaimini seems to have taken this concept from his guru. Rama’s glowing iron arrows were as useless as a poor man’s desires in a miser’s home (36.58). Mairavanacarita and Sitavijaya are bereft of such interesting conceits. The only common feature is the use of hyperbole, especially in battle. The Jaimini of the Ashvamedha exaggerates outrageously. However, in Mairavana and Sitavijayapeople do not grow on trees, horses do not turn into mares and tigresses, and no rakshasi has eight-mile-long breasts, which she uses as weapons in battle! The Ashvamedha effectively uses all the nine rasas. In Sitavijaya and Mairavana, only vira and bhayanaka with a sprinkling of raudra are seen, with adbhuta ruling. In Mairavana, Hanuman increases and decreases his body at will, creates an impregnable fort with his tail, Brahma constructs an amazing defence for Mairavana’s palace, Mairavana shape-shifts continually in battle, like Mahisasura fighting Durga. In Sitavijaya, Ravana has a thousand heads and two thousand arms, his brothers have hundreds of heads, eyes, bellies and hands, the diseases fight a terrific battle, Hanuman is given five heads, grass columns turn into blazing missiles, and so on. A major difference between the Ashvamedha and these two manuscripts concerns variety. The Ashvamedha has many side stories, tales within tales, e.g. Agni and Svaha, Uddalaka and Chandi, Malini and Yama, Chandrahasa, Bakadalbhya, the golden mongoose, the quarrelling Brahmins, Babhruvahana’s exploits, etc. Almost all the sections contain different narratives. The battle sequences, the mainstay of all the three texts, are singularly dissimilar. Those in Sitavijaya are monotonous. The characters change, but the sequence of events is more or less the same in all, except the last battle in which Sita slays Sahasramukharavana with a grass-missile. Hanuman also uses mantra-infused blazing grass against Mairavana, but ineffectually. Here the descriptions of battles read more like the report of a war correspondent than literature. We miss the exuberance and creativity of theAshvamedha’s Jaimini. Besides the heroic, the other ruling sentiment of the Ashvamedha is Vaishnava bhakti. All the protagonists worship Krishna even as they fight him, their bhakti masked by the animus they display outwardly as they wish to receive death as his grace. The battlefield is their temple where they worship their deity with weapons. Krishna is worsted by them because the essence of the concept of bhakti is that the deity must be overcome by the intensity of the bhakta’s bhakti. In Mairavana and Sitavijaya there is little bhakti. While the former is dedicated to the glory of Rama and the latter to Krishna, there is but a single paean to Rama at the beginning of the former and at its end. The latter has paeans to Hanuman and to Sita’s wondrous form towards the end. How can an author, so immersed in Vaishnava bhakti in one work, be almost completely bereft of it and extol Hanuman and Shakti in the two others? An underlying current of Shaivism runs through the Sahasramukharavanacaritam. The crisis it deals with is precipitated by two insults: the first is by the Trinity to Anasuya; the second is to Shiva’s avatar Durvasa at Mandhata’s yagya. The latter parallels the insult to Shiva at Daksa’s sacrifice, which is destroyed by Virabhadra and Kali, routing all the sages and devas. The names of Durvasa’s sons, who rout the devas, are among the thousand names of Shiva in Section 284 of the Mokshadharma Parva of the Mahabharata. The presence of Shiva in Vyasa’s Mahabharata is quite significant, though understated. Therefore, Jaimini is not blazing an altogether new trail here. 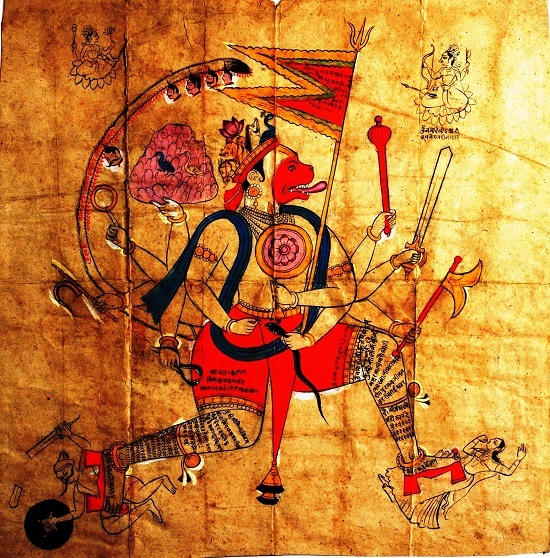 The dreadful destructiveness of Durvasa’s sons is of a piece with other demons originating from Shiva such as Andhaka, Bhasmasura and Jalandhara. Here Hanuman is a product of Shiva’s sperm and has five faces like him. However, the heads of lion, horse and boar represent avatars of Vishnu and his mount Garuda. This is, therefore, a Hari-Hara image, a fusion of Vishnu and Shiva. Parallel to the pair of Virabhadra and Kali, we have here the pair of Hanuman and the shadow-Sita. There is a feature that indicates the somewhat casual attitude of the author of these two works. The names of the characters take different forms at different places. Matangi becomes Sita, Ustramukha becomes Osthamukha, Vakranasa becomes Vakranetra, and so on. This is a defect noticed in both the texts. The sincerity with which the Ashvamedha was created is missing in these. However, these could be copyists’ errors. There are many such instances throughout the text. The qualitative difference between the excerpts is obvious. How can a poet capable of describing so beautifully in the first instance hardly use his talent in two of his own works? So is it with the dialogues. In the Ashvamedha there is profusion and variety. Dialogue is used to establish characters and situations effectively. In Mairavana and Sitavijaya there is only martial talk and the occasional paean. These two texts cannot stand beside the poetic elegance and expanse of the Ashvamedha Parva. It is unlikely, therefore, that their author is the same, although they might belong to the same “Jaimini” school. Is their Author the Same? Were Mairavana and Sitavijaya composed by the same author? The language and the style seem similar. As in Mairavana Rama and Laksmana are abducted when asleep, so, too, in Sitavijaya are Bharata and Shatrughna. In both, mantra-infused grass is used as a missile and the supernatural prowess of Hanuman is celebrated. However, an interesting difference in the colophons of these two works raises a doubt. The colophons in Mairavana mention Shri Jaiminibharata without stating the parva concerned. The colophons of Sitavijaya ascribe it to the Asramavasa Parva of the Jaiminiya Mahabharata. Would the same author composing two stories use different names in the colophons denoting the principal work of which these are parts? Is Mairavanacarita part of Jaimini’s version of the Bharata? But, then, is it not a fringe episode? Our tribes have analogous versions of both the stories Jaimini relates. 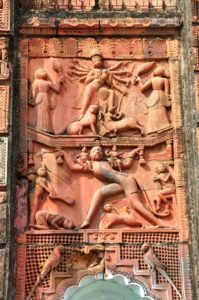 Writing on the Mundas of Chhotanagpur, K.S. Singh notes that they believe the vanaraswere forest dwelling tribes who wore part of their dhoti trailing loose as a tail, as the Mundas and Savaras still do on their dancing ground. The episodes also occur in Ramayana retellings and plays in South East Asian countries. However, there is no mention of these two stories in the Rama tales of Sri Lanka, Tibet, Khotan, Mongolia, China, Japan and Vietnam (Champa). There are Tamil two tales relating to the hundred headed and thousand-headed Ravanas, Sadamuka Ravanan Kathai, Sahasramuka Ravanan Kathai, that do not not occur in Kamban. In Telegu there is a similar Shatakantha tale, which occurs in Assamese, Oriya and Bengali Ramayanas too. In the Uttarakandaof Ramamohan Bandopadhyaya’s Ramayana (1838), the tale is retold along the lines of Chandi’s killing of the demons Shumbha-Nishumbha. Jaimini’s version, running to fifty chapters, is very different. The interlocutor is Janamejaya and the narrator is Jaimini. However, in slokas 10-11 of the first chapter, the last verse of the second and slokas 30-31 of chapter 50 at the very end, there is someone else, nameless, who is narrating what Jamini told Janamejaya. This would be a suta, a wandering rhapsode. He is never named here. Jaimini alone provides the cause for the birth of the thousand-headed demon along with his brothers, with hundred heads, hundred bellies, hundred tongues and hundred eyes, viz. the insult to Anasuya by the Trinity and to Durvasa in Mandhata’s sacrifice. Bharata and Shatrughna are abducted and married off (without any demur) to the demon’s daughters. In the battle the devas, monkeys, rakshasas, kshatriya kings with their armies, Rama and even the Trinity fall. That is when Sita takes the field, bestowing five heads on Hanuman with which he devours the demonic army. With fiery grass columns she despatches the thousand-headed demon. Rama is not terrified of her, as her form is not horrifying, though wondrous. After being paeaned at length, Sita joins Rama and all return to their abodes. The demon’s city is divided between Citradhvaja and Citraratha, the sons of Bharata and Shatrughna who are not mentioned in any Ramayana. There is no mention of Bharata and Shatrughna being accompanied by their new wives when the four brothers meet their mothers back home. What is of great interest is that here Sita does not abandon Rama and her sons to disappear into the bowels of the earth. All kings condemn the washerman (there is only this cryptic mention) and praise Sita, whom Rama embraces. Brahma gives him a span of eleven thousand years to rule, as in Valmiki. Janamejaya is eager to know what further deeds Rama did after the return to Ayodhya. Jaimini responds by telling Janamejaya that what he has been narrating so far is (part of) the story renowned as Ashramavasa Parva beginning from the victory of Sita till the death of King Dhritarashtra. The closing benediction dedicates the work to Krishna. The tale is completed in twenty chapters. Jaimini’s creation is quite distinct from other versions. It is not an episode composed by Valmiki, but by Jaimini and is narrated by Agastya to Rama to celebrate a wondrous nocturnal deed of Hanuman. He rescued Rama and Laksmana who were overcome by an enchanted sleep and abducted by Mairavana to the nether world. In Jaimini it is not Laksmana but Rama who, enraged with Shurpanakhi’s amorous advances, cuts off her nose as Ravana informs Mairavana. Indeed, in the entire story, neither brother has any role to play, being asleep throughout. 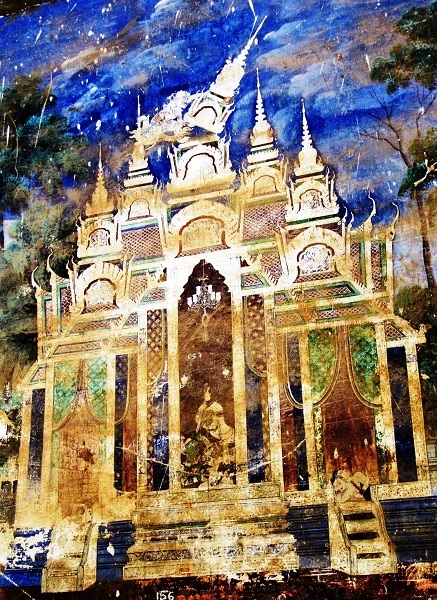 In Cambodia, on the walls of the Silver Pagoda in Phnom Penh, extending for 642 metres, reaching a height of 3.65 metres, frescoes of scenes from the Ramayana were painted during 1903-04 by a team of 49 artists led by Oknha Tep Nimith Theak. 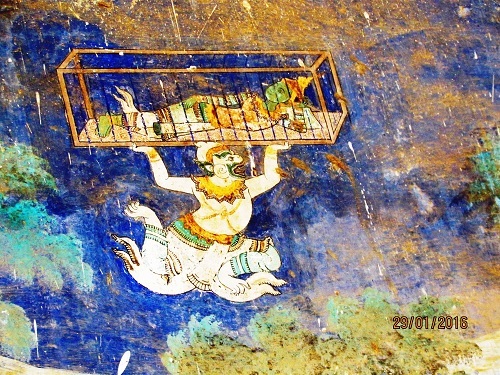 Among these is a huge fresco depicting Mairavana’s abduction of Rama and the rescue by Hanuman. 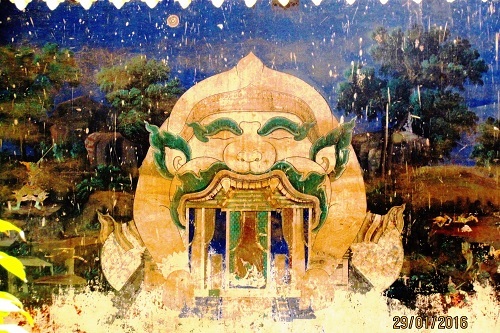 Silver Pagoda, royal palace, Phnom Penh, Cambodia, fresco depicts Hanuman swallowed Phrea Ram to hide him from the Demon (left) who shoots a bright globe into the sky so that all think it is dawn and safe and fall asleep. Hanuman keeps Phreah Ram on the Asorakan Chantak Mountain watched over by the deities. 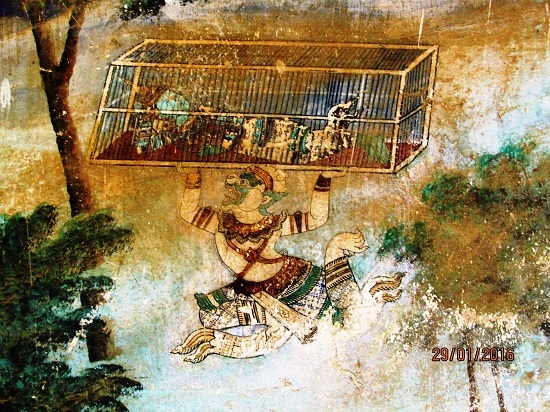 Mairavana gains access to Rama and Laksmana by assuming the form of Vibhisana and carries them off in a magical box. Entry to the underworld is via a lotus-stalk known to Vibhisana. Hanuman’s son by a makari is named Matsyaraja. The entry to the palace is through a magical bridge Brahma made that collapses if an enemy steps upon it. The demon is killed a hundred times but keeps resurrecting. His life lies in the seven horns of a seven-headed bee, which Hanuman destroys and then pulverises him. Rama and Lakshmana remain asleep. Mairavana’s sister Durdandi is the helper here, not a serpent princess. Her son Nilamegha is crowned king of the netherworld and marries Mairavana’s daughter. The bard states that this narrative was not related by rishi Valmiki, who considered that the bringing of the medicinal herbs by Hanuman was heroic enough, but was narrated by Jaimini. The final benedictory verses state that the Ramayana or the Mahabharata must be in every village, otherwise an expiatory vow must be observed. Hanuman’s twelve names are given as the mantra for success. One would have expected the Hanumannatakam  or Mahanatakam to narrate these wondrous exploits of Hanuman alongside Sita and his rescue of Rama and Laksmana. Strangely enough, they do not feature in this Sanskrit play whose author is supposed to be none other than Hanuman himself. P. Lal: The Mahabharata of Vyasa: The Complete Adi Parva, Writers Workshop, Calcutta, 2005, (the last two lines have been amended by me to make it a faithful translation). S.K. Sen, (ed. P. Bhattacharya), The Jaiminiya Ashvamedha Parva, Writers Workshop, Calcutta, 2008, pp. 17-18. D. Sanderson: Jaimini Bharata in Canarese with translation and notes, 1852. Sen, op.cit. pp. 19-24 has an excellent discussion of this. K.S. Singh ibid., p. 50. T.B. Naik, in K.S. Singh ibid. p.35. Bulcke, op.cit. pp. 204, 501. Saraswathi Venugopal, p. 103 ibid., quoting T.P. Meenakshisundaran, Tamilum Pira Panpadum, 1974, p. 118. W.L. Smith, Ramayana Traditions in Eastern India, Munshiram Manoharlal, New Delhi, 2nd edition, 1995, p. 137. D.C. Sen: The Bengali Ramayanas, Calcutta University, 1920 (reprint Hard Press, Miami), p.228. 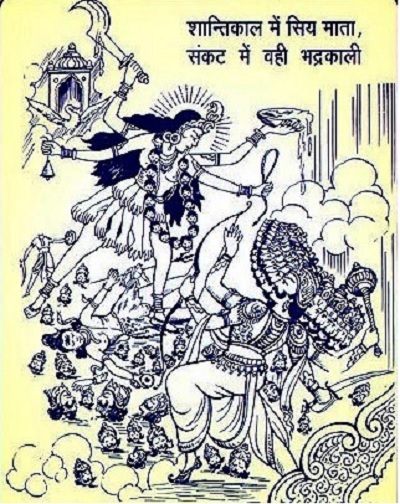 https://archive.org/details/HindiBookAnandRamayan, pp. 412-422; W.L. Smith, op.cit. pp. 136-137. Bulcke op.cit. pp. 136, 501; V. Raghavan, Studies on Ramayana, Dr. V. Raghavan Centre for Performing Arts, Chennai, 2009, p. 161. Mss nos. D 12215 and 12216 in the Government Oriental Manuscripts Library, Madras, vide D.B. Kapp, “The Alu Kurumba Ramayana” p. 124. 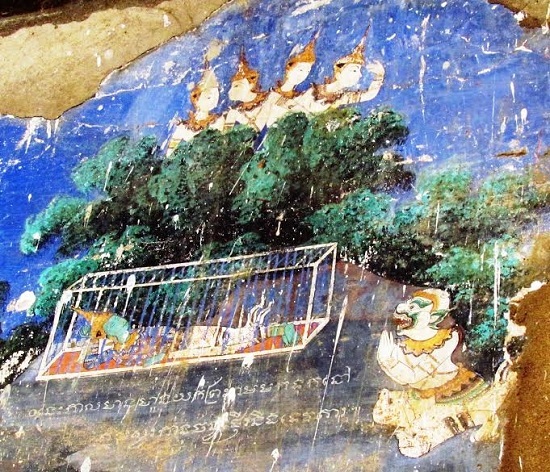 Personal communication from Ms. Chan Monirasmey, Tourist Guide of Phnom Penh, who has provided an excerpt from Chatomuk Mongkul’s The Royal Palace, Phnom-Penh that mentions the frescoes. Mannalal Abhimanyu ed. : Hanumannatakam, Chowkhamba Vidya Bhavan, Varanasi, 1992 2nd edn. Filed Under: IN THE NEWS, STORIES, ESSAYS & POSTS Tagged With: Jaiminiya Mahabharata.